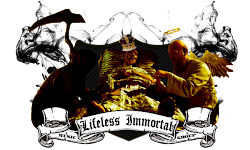 Lifeless Immortal allow you to release unlimited mixtapes while running campaigns to promote your music throughout the year and more. We provide high-quality service in management, distribution, music production, book publishing, graphics, web development, tour assistance, pre-production, mixing/ mastering, visual/ audio commercials, voice-overs, video production and more. We treat every Immortal artist like a soldier, in which they are! Mainly, we set up campaign packages based on the artist's needs and the economic direction of the Music Industry. We can assist the artist with shows, just let us know and we can have one of our Booking agents get all set up. Through our 906 Battalion, we provide artist development for the ones that could need a little kick-start in their career. First, we see where an artist is at lyrically then we move on to the other aspects such as Rhyme Structure, Flow Meter, Web Presence, Productional Interest, Social Engagement and more. Next, we get the artist ready for LI Boot Camp. After Boot Camp comes Advanced Music Industry Training (AMIT). Mainly AMIT provides the prolific artist with essential knowledge before entering the Major Recording Industry, which takes about 3 months to complete… But it's worth it based on you receive the LI Manual and the Semi-Major Industry Directory as well as lifetime connections. Note! All members must pay yearly dues to stay active! Once paid, your service package will be issued. Price of the digital version of the Immortal Service Pack (ISP) is included inside of your membership agreement. The length and royalty percentage of your contract are negotiated between the member (Artist/ Producer) and the company. Managers are to set their own prices for their management fees, which must not exceed 30%. For non-musicians, membership dues are a different price, due to the services rendered. Artists, Musicians, Producers, MCs, Lyricists, Military Veterans, Martial Artists, Authors, Scholars, Professors, Teachers, Sifus, Masters, Street Team Representatives, Backup Singers, Dancers, Animators, Cover Models, Video Girls, Flyer Girls, Programmers, Recruiters, Club Promoters, SOcial Media Promoters, Councilmen, Enlightened individuals, Ex-Gang members that would like to make a 180 degree change, Fashion Designers, Beautiful Women and College Students majoring in Music and Theater. All races, genders, religions, and walks of life are welcome. Why are the perks of joining? We provide our souljas with Official Immortal Dog Tags with their Immortal name, rank and affiliation code.With each membership, we included distribution as well as exclusive graphic designs from the best in the Industry. So that artists have something to show for, we offer physical proofs of the artist's project in a full jewel case with a 4-panel booklet, trayliner, disc, UPC, industry standard logos, and QR code to access the digital version. Our systems allow artists to drop unlimited mixtapes, hosted by our head DJ in charge, DJ Vietnam. There are two steps you need to complete to join the Lifeless Immortal Army. First, you need to fill out the registration form on our Join page. Next, send your music over to our email: moc.liamg|tgmlatrommisselefil#moc.liamg|tgmlatrommisselefil along with your picture and a short bio (no longer than 1000 words). If you are interested in applying to join the Lifeless Immortal Army, then you first need to register for an Immortal SocialBASE account. Our Immortal SocialBASE is the platform used to rebuild the common artists into Militarily minded musicians. If you already have a Lifeless Immortal account, then please provide the 7SG with your username and email address. If you do not already have a Lifeless Immortal account, then you can begin registration by clicking the 'create a new account' link above. The registration process will involve providing a valid email address that a verification code can be sent to. Once you have this code, follow the link in the email to enter the code and complete your Lifeless Immortal registration. When you have registered and logged in, please return to this page. Only you can decide which best services is best for you, the only thing that we can do is advise. Just know that artists without budgets are recommended to choose Management along with their official LI Membership.